Install the Gitlab Runner on your web server. I’m not going to go over this one in much detail (none actually) as the documentation for getting the runner installed is pretty good. If you’re like me and you run your own private Gitlab install, but are not *that* familair with git and git tagging you might become confused about how the runner tagging works, since you can assign tags to entire repos in gitlab. 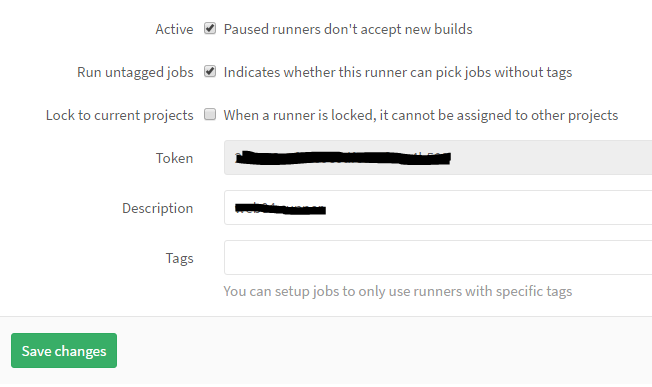 On the Runner settings, found in the admin section under Runners, then clicking on the runner token number, you have an option to set which tags will fire this runner. This corresponds to the tags on individual commits, and not the tag set to the repo. If you want specific repo’s to always use specific runners, such if you have different webservers, you will need to manually assign the runner to that repo. You can do that from the runner’s setting screen, or from the repo. Unless you want to the madness that is Git Tagging I suggest you leave the “Tags” field empty and the “Run untagged jobs” box checked. Make sure “Builds” is checked. Go to your repo settings. In Gitlab 8.11 that can be done by clicking the gear icon in the upper right corner of the screen when looking at any other “Project” page . 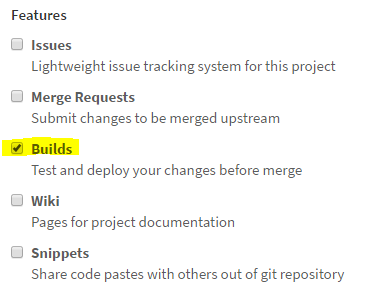 Scroll down until you see “Features” and make sure that “Builds” is checked. In this case I don’t need any of the other features so I uncheck them. You don’t have to, but if you aren’t going to use those features it will clean up the Project overview screen a good bit if you turn them off. The options you see here will vary depending on what features you have enabled, and other settings in your project. This one is sort of optional, but if you have multiple small projects you can use variables in your build script (you’ll see it in a couple of steps) that allows you to re-use the same build script in multiple projects and set the few unique variables from the project itself. 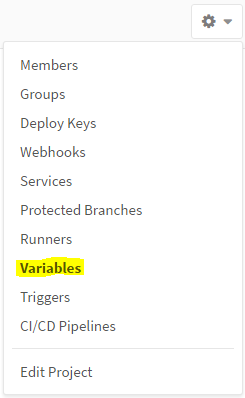 You get to the variables settings page from any other page in the project by clicking on the Gear icon in the upper right. 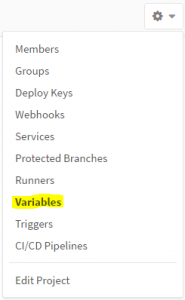 Set the Key to “webroot” and the value to the web path on your webserver where your site’s files reside. For example, it’s normally /var/www/, so I set “/var/www/mydomain.com/”. The trailing slash is important here. You should see this once you’ve added the new variable. You might see some errors around the project indicating that builds are not configured or working correctly. 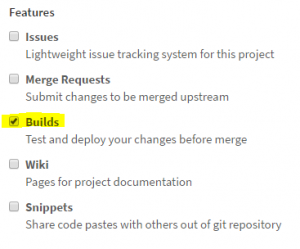 The specific message seems to be to change from one Gitlab version to another, and from one screen to another, but all of them are indicating that you have builds enabled for your project, but no build script. Create a file named “.gitlab-ci.yml” in the root of your project. Note the leading period is important. If you’re trying this from Windows it might give you grief about it, I ended up kidnapping a .htaccess file from another project and renaming it. NOTE: WordPress likes to strip leading spaces. Every line except “stages:” and “pages:” are indented 2 spaces. So whats going on here? This is a Gitlab CI build script, and it basically instructs the CI to do various tasks. Normally this is used to compile code, check it for simple mistakes, etc. We’re going to re-purpose its ability to execute bash/batch commands (even on windows) to push our files where we want. You can read the full documentation here. I’ll break down my script for you if your eyes got a little glossed over after trying to ingest the official help documents. Line 1 tells CI that we’re declaring our stages. You can have as many stages as you want, but they must all be either “build”, “test” or “deploy”. Since we’re not compiling or testing code, we just declare a deploy on Line 2. Line 4 is your stage name. You are free to call this whatever you want. Since I was working off the official “Gitlab Pages” build instructions, my build is called “pages”. Line 5 declares that this is our deployment stage. Line 6 declares that the following lines will be our batch script. Lines 7-9 are batch scripts, executed sequentially. Note that on linux systems these should be bash scripts, while on Windows you should use batch syntax and commands. Line 7 is a sanity check for our variable. If it isn’t set, this check dies and returned a 1 exit code, which causes the entire build to stop and fail. This prevents rsync from doing anything funny if you forgot to set the variable, and if you have build notifications enabled, you’ll be prompted with the text “Need to set webroot”. Line 8 is the real meat & potatos of this whole thing. Since this commands run from the temp folder the runner makes for itself, this grabs the entire contents of the current folder “./” and rsyncs it to our webroot folder. You did set that variable, right? The three exclude flags tell rsync to ignore the git & gitlab specific files. You’re free to add more if your project needs it. The –delete flag tells rsync to delete anything in the webroot folder that isn’t in the new temp folder. If you delete a file from your repo, this step makes sure its also cleared from your webroot. If you like to keep your web-facing code someone else other than the root of your repo (such as /pub_html or some such) you will need to adust the “./” to be “./pub_html” or w/e you use. Line 9 changes the ownership of the new files in the webroot to be whatever owner & group you want. This isn’t strictly needed, if your project is strictly read-only from the web server side of things this step can be skipped. I like to have this set to same owner & group as if I had uploaded the files, in the event I need to SSH in and make a quick change to (zomg, testing in prod?) something real quick to appease the Powers-That-Be before committing the change to the repo. Lines 10 & 11 makes it so that this job will only fire for changes to the ‘master’ branch. You could use this to have multiple branches deploy to different folders if you wanted, but you would need to extend the variables and/or adjust the rest of the script. This will allow the gitlab runner to run any sudo command. It is a potential security issue being wide open like that, and if it concerns you you can lock it down a bit tighter. Thanks! I had to remove all HTML codes because the build kept complaining over unexpected “&”, but other than that it works like it should. Thanks! I, too, was a little confused by the official docs but this really cleared things up.